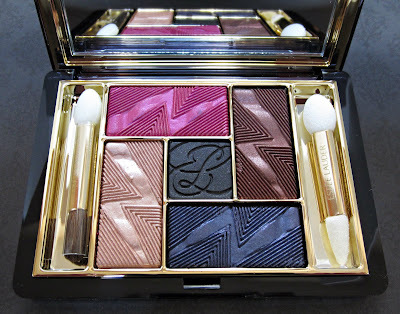 Estée Lauder's Violet Underground Pure Color 5-Color Eyeshadow Palette is part of the Violet Underground Collection for Fall 2012. I know I've said it before, but after Tom Pecheux joined Estée Lauder as its Creative Makeup Director, they have been turning out some beautiful color cosmetics. Mr. Pecheux is the reason my personal stash of EL products has grown from several nail polishes, some skin care products, and a couple of GWP items, to let's just say, a whole lot more! ...oh my goodness! Isn't that a gorgeous array of patterns, textures and colors? I'd like to transform it into a print and display it on the wall. It looks like a work of art to me! 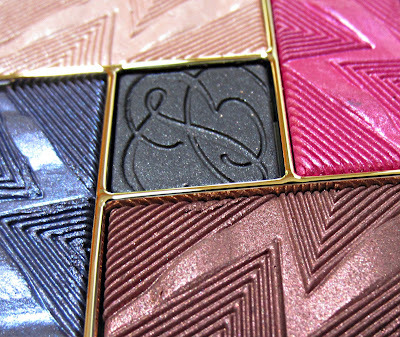 There are 3 vibrant shades, a highlighting shade, and a smaller matte black shade. These are the tri-brid gelée technology, which have the feel of a powder shadow, but apply more like a creme. They're shiny and glossy, wear exceptionally well without creasing or fallout, and are packed with rich color. I love EL's Cyber Eyes and their new Vivid Shine shadows, because the formula they've developed feels like velvet, but wears like iron. So I knew this newest palette would become a fast favorite of mine. I'll admit that I didn't think the bright magenta would get much use from me, but I was wrong. 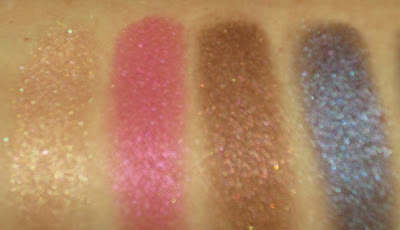 As you can see in the swatches below, it isn't that bright. 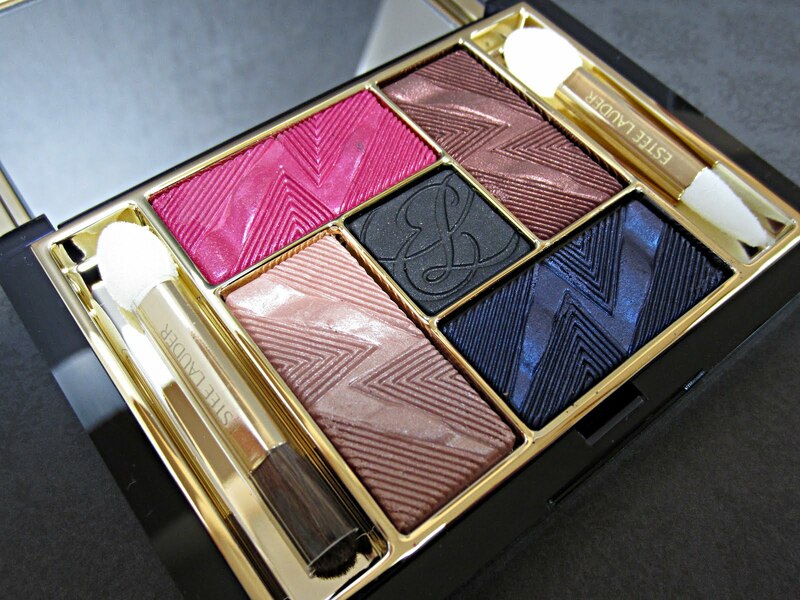 It's definitely wearable, and I've used it as a blush as well, using a light touch for a nice color look. The other 3 shades are right up my alley for my brown eyes, and I use the black center shade as an eye liner. Below are swatches using just one pass with my finger, so they can be more subtle, or full-on intense if you build them up a bit. Applying them wet will intensify them all the more. The first photo was taken in sunlight, and the second photo was taken indoors in natural light. The highlighter shade is on the left, and it's a champagne color with a very pale peachy/gold tint. Then you have the bright magenta hue, a stunning crimson shade with slight coppery gold features, followed by the rich indigo blue that seems to sit over a blackened base. The shade on the far right is the matte black, recommended in the official description to structure and define the eyes. This shade is perfect to give your eyes a smoldering look. Below is an intentionally blurred photo to show you the tiny color burst flecks in each of the 4 larger shades. This is such a versatile set of colors--you can get some really edgy looks with it, and just as easily, you can create some beautiful subtle looks. I love that Estée Lauder keeps coming out with such great products lately--have you seen the new polishes for Fall? Their image is definitely starting to reach new audiences, and I look forward to their future offerings, although my wallet may tell you otherwise! I picked this up at Nordstrom, and it retails for $48.00. This is so pretty! I wasn't blown away from what I saw via the promo pics, but wow, I might need this. thanks for such a great post with excellent pictures. 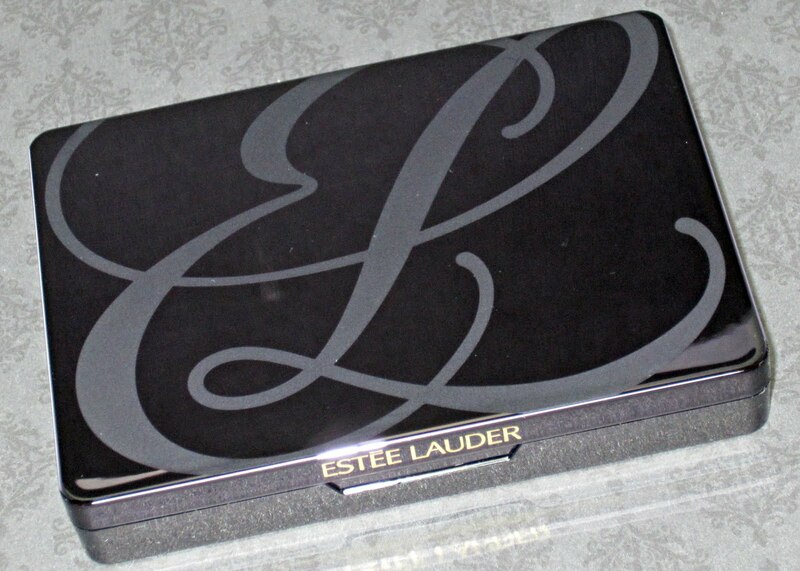 I agree; Estee Lauder seems like a different company these days.